This is a quarter mile of fence. Pictured above is the post pounder on the front of our tractor. 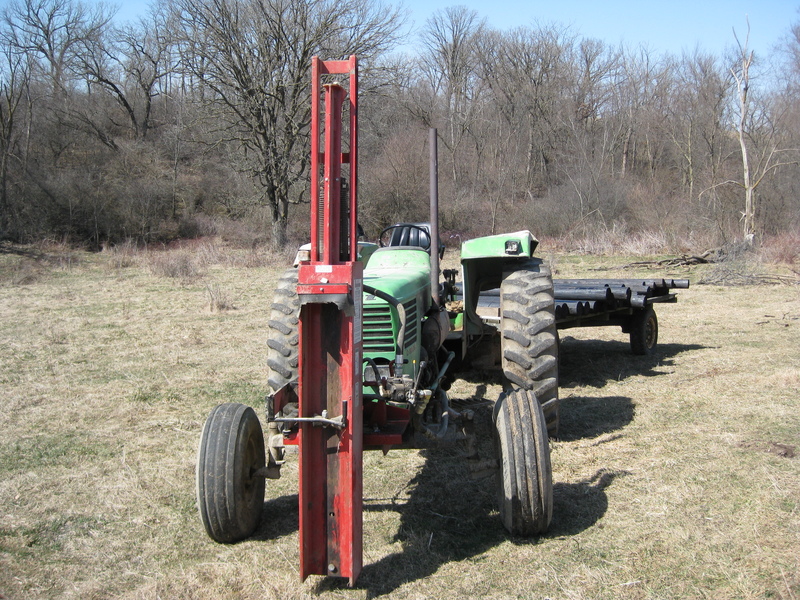 It is a machine that pounds posts into the soft ground without the need for digging a hole. It saves a lot of time. We purchased it new for $2,000 a couple of years ago. It replaced the one we had used the previous thirty years. 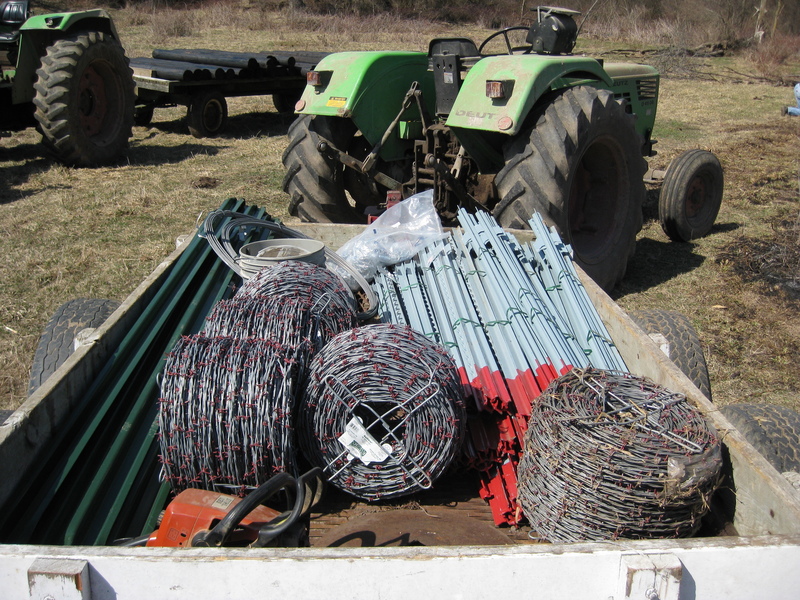 Most of the materials needed to build the fence are pictured below. 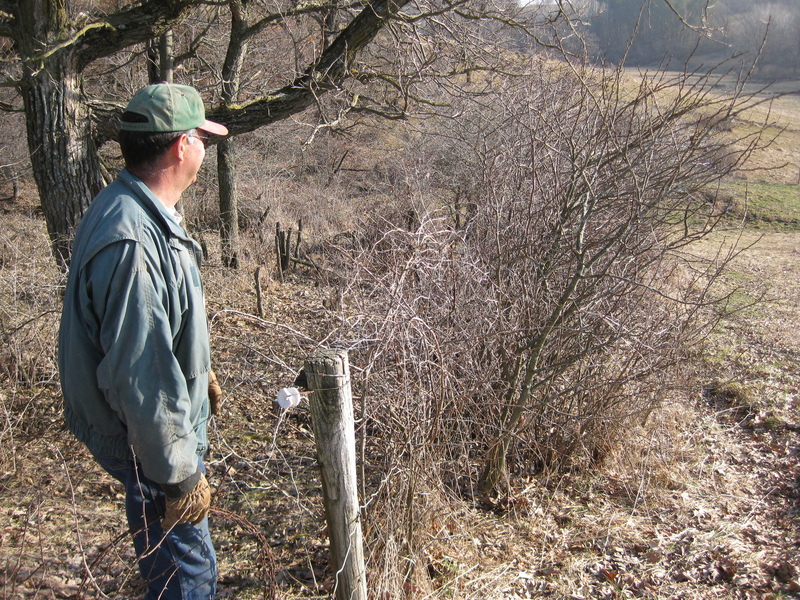 We used 100 steel posts, 15 5×7 wooden posts, 12 6×8 wooden posts, 6 ten’ steel braces, 1 roll of brace wire, 5 rolls of barb-wire, staples, and clips. The costs for the materials are as follows. 100 steel posts @ $3.95 each, equals $395. 15 5×7 wooden posts @$12 each, equals $180. 12 6×8 wooden posts @$18 each, equals $216. 6 ten’ steel braces @$14.99 each, equals $90. 1 roll of brace wire @$10.99 each, equals $11. 5 rolls of barb-wire @$64.95 each, equals $325. Clips are included with the purchase of the steel posts and staples are relatively cheap. So the grand total is $1217. Multiplied times four equals the cost per mile, $4868. Not a cheap fence, but we expect it to last thirty years. Will I be around to build its replacement? Who will I be working with? 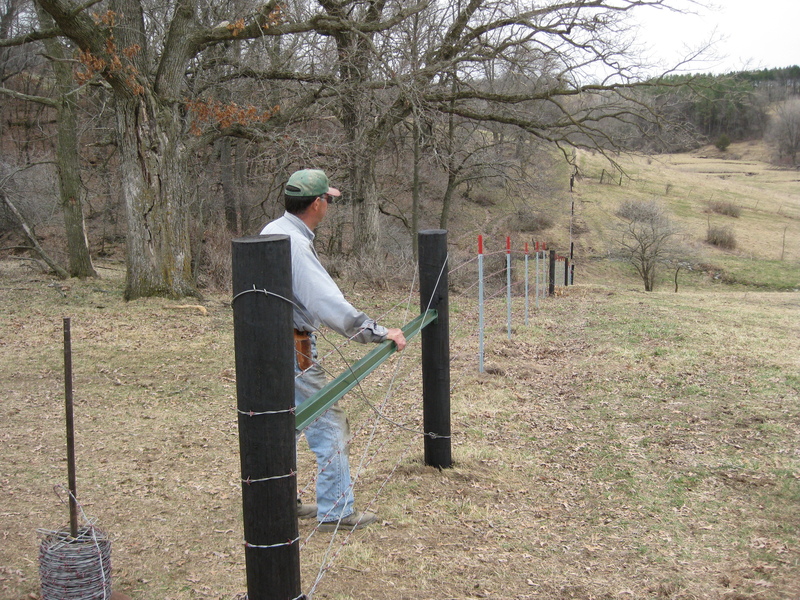 Following posts will go into more fence-building detail with pictures and explanations. This entry was posted on Tuesday, May 11th, 2010 at 8:03 pm and is filed under Curious cattle, Curious livestock costs, Curious machinery. You can follow any responses to this entry through the RSS 2.0 feed. You can leave a response, or trackback from your own site. I’m impressed that you got the male model back to gaze in the same direction wearing the same hat. Holy cow that pounder on the front of the tractor looks like a dream to use. I remember having to put in those dammed posts using a hand pounder that slid over the post. I take it the tractor version must be powered via the hydraulics? It would be cool to see a video of that baby in action! That’s hilarious, Chainey! I would only have a problem if I asked him to change his hat.